Baker McKenzie is optimistic on Australia’s economic outlook for 2017 as it topped equity capital market league tables in the country for 2016. Andrade said that several factors lead the firm to be optimistic about Australia’s prospect for the year despite some challenges ahead. According to capital markets league tables published by Thomson Reuters, Baker McKenzie advised on more lead manager side ECM deals than any other firm in Australia with 13 deals. It tied at first place with Herbert Smith Freehills on the issuer side with 15 deals. 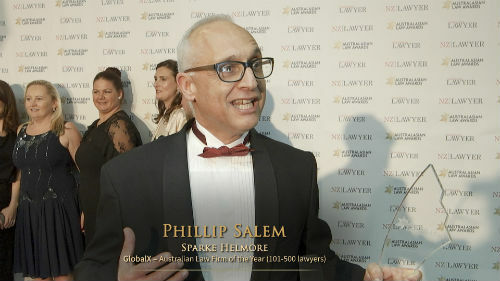 The development was welcomed by the global firm, which placed third in the 2015 league tables for manager legal advisors. Last year, it was sixth on the issuer side league tables. On the lead manager side, Herbert Smith Freehills took second, same as 2015, with 10 deals. Gilbert + Tobin and Clayton Utz placed third with nine deals apiece. Gilbert + Tobin is down from being first in 2015. 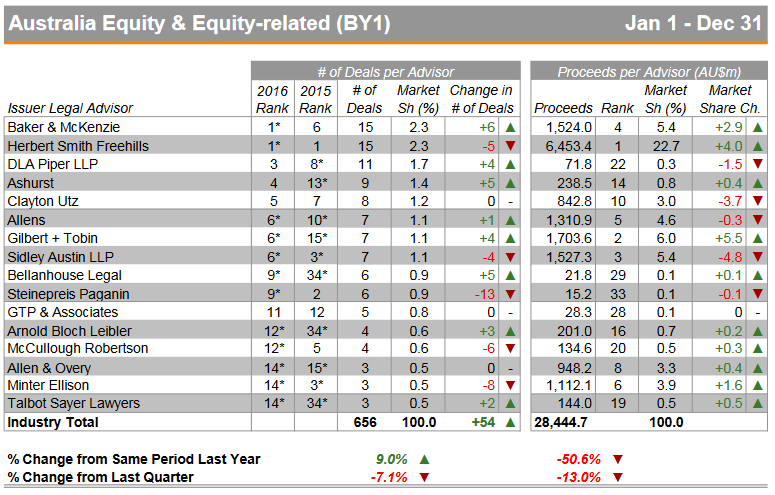 Completing the top five is Allen & Overy, a spot higher than its showing the previous year, with eight deals. 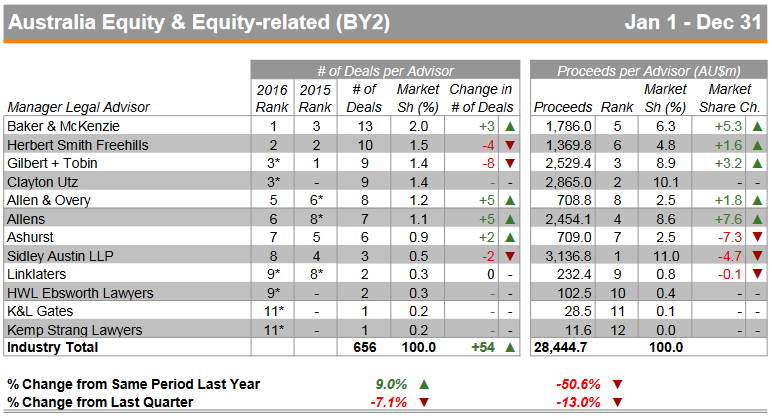 Meanwhile, on the issuer side, DLA Piper took third, up from eight the previous year, with 11 deals. Ashurst came fourth, a massive improvement from its 13th place in 2015, with nine deals. Clayton Utz ranked fifth, up from 7th the previous year, with eight deals. Recent roles taken on by Baker McKenzie include advising JP Morgan and UBS as joint lead managers on the $494 entitlement offer by Qube Holdings to fun Qube's participation in the c. $9 billion takeover of Asciano. The firm also advised Elanor Investors Group on the IPO of the Elanor Retail Property Fund, APN News & Media on their $273 million jumbo offer to fund their acquisition of Adshel, along with APN's previous $180 million entitlement offer and demerger and NZX listing of NZME.